Takeaway: This is what memoir and audiobooks should be about. Hard to praise it too much. There are books and authors that should be listened to and not read. And sometimes there are productions of audiobooks that are so well done that the audio is better than the paper. In this case, both are true. Perfect audio does not do anything for weak content. Fortunately, this is good content. This is a pretty detailed memoir. At a little more than 350 pages, the main complaint I have seen is that it is too detailed and does not take us further into her life. It takes her through the birth of her first child and just before she starts filming Mary Poppins (her first real film role). The ending is almost a cliff hanger and I really look forward to another book. What most struck me throughout the book was how different the world was when she was starting out. Her family was a fairly successful entertainment family, but still had real money problems. Her parents divorced early and Julie went with her mother and her brother stayed with her father. There is a lot of detail about the war years and the beginning of Julie’s singing lessons and early performing. The family situation was not good and while she does not gloss over the pretty bad situations, she also does not dwell on them. Things were bad, but she and her family made do and moved on. 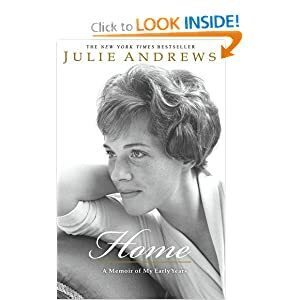 Julie’s rise as a performer coincided with the decline of her mother and step-father’s careers. In many ways that was fortunate. By 16 she bought out her step-father’s portion of the family home (and soon after her mother’s) and by 17 was essentially supporting the whole family. Musical Theater was not a high paying job and supporting a family as a teen was rough. I have a hard time thinking that the level of humility and grace that is illustrated here can be matched by anyone of this generation’s teen stars. Sure lots of their parents have taken advantage and ripped them off, but that does not give rise to humility and grace, it just gives rise to a bad family situations. Maybe there will be some, but we will only really know with time. I am frankly surprised how much I enjoyed this book. I don’t think I have seen more than a handful of her movies (and not sure any of her non-Disney ones except Sound of Music). But I am charmed. I am just enjoying the book as well as the audio book and I am having a blast with this wonderful artist! I love the details, the “recreation” of a time where things were so difficult and artists were pursuing their craft with discipline, real talent (multi-talents in Julie’s case) and as you well said: Humility and grace. I do believe Julie Andrews is one of a kind. Thank you for sharing. I’m also a Kindle Fan!!!! And an avid reader! Thanks again for this review and I do agree that it is a “masterful” audio book! I’ll have to listen to this. Julie always strikes me as a classy lady. I read a children’s novel she wrote years ago, so I already knew she is a good writer. Thanks for recommending the book.